Want to know more about the pokies in Australia? 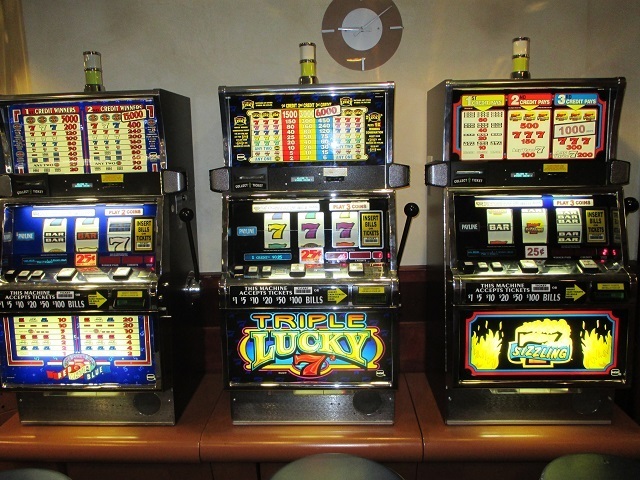 Slot machines, one-armed-bandits, electronic gaming machines (EGMs), ‘slots’, fruit machines or pokies’, these automated gambling devices are something of a national pastime and account for an annual turnover of around $142 billion each year. A fun and easy way to gamble, pokies have been around for decades and can offer some big wins. In this guide, we take a look at the stats behind the pokies, where you can play them (state-by-state) and some alternative ways to playing with online slots. Introduced to Australia in 1956, Queensland was the first state to license electronic gaming machines. Over the last sixty years, the number of EGMS has increased to an estimated 200,000 making Australia the country with the 4th highest density in the world. In fact, Australia’s proportion of gaming machines accounts for almost 20% of the world’s total. Introduced over 60 years ago, most pokies are now digital and no longer of a ‘one-armed-bandit’ style. Image via Pxhere. Of course, the highest number of machines are located in the United States. However, on a per capita basis Oz has five times the amount of pokies per person than America. This huge density is a concern for opponents of gambling in Australia and many believe that the proliferation and ease of access to these machines is the basis for the country’s problem gambling phenomenon. It’s a chicken and egg situation for most observers and the issue of which came first is sure to be debated for years to come. What is true is that the average Australian spends $650 a year on pokies with an estimated 600,000 players regularly feeding the pokies on a weekly basis. With machines capable of taking up to $10,000 a time, there is certainly cause for concern in the minority. There is no doubt that, for some, gambling can be an addiction and the pokies are not immune when it comes to the need for responsible gambling. With 80% of the population engaging in some form of gambling, Australia has the highest rate in the world. It is estimated that the average Australian spends a total of $1,272 each year. 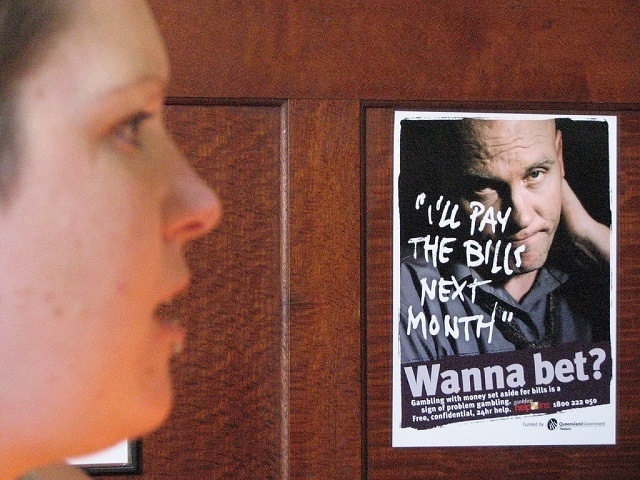 For the vast majority of Australians, gambling isn’t a problem, but for some the effects can be serious. Image via Flickr. Serious problem gambling has been identified in at least 0.5% – 1% of the population with up to 2.1% experiencing moderate risk from the habit. In an effort to tackle problem gambling, the Australian Government has introduced a range of legislation including restrictions on the advertising of gambling and a clampdown on illegal online wagering through offshore sites. The pokies aren’t exempt from the spotlight and, along with strict licensing policies governed by each state, some states are looking at restricting access to pokies to state licensed casinos only (see Tasmania, below). Bans on machines that take $100 notes was brought into force in 2007 and also covered ‘auto play’ features. There is one exception to this piece of law which is in place at the Crown Casino in Melbourne where VIP players can still use an auto play feature. At present, most venues are restricted in terms of their license numbers and have to prepare a local impact assessment report on their community before being granted a license. Gaming machines are licensed and controlled by each individual state with some (like Western Australia and, soon to follow, Tasmania) restricting their licensing to the casinos. Pokies are one of the easiest and most accessible forms of gambling in Australia however you must be 18 years or over in order to take part. The machines take many forms but principally offer the same way to play; three or more reels are spun by paying the minimum gaming stake with a combination of matching symbols offering prizes or the chance to play another game of luck (such as dice rolling). 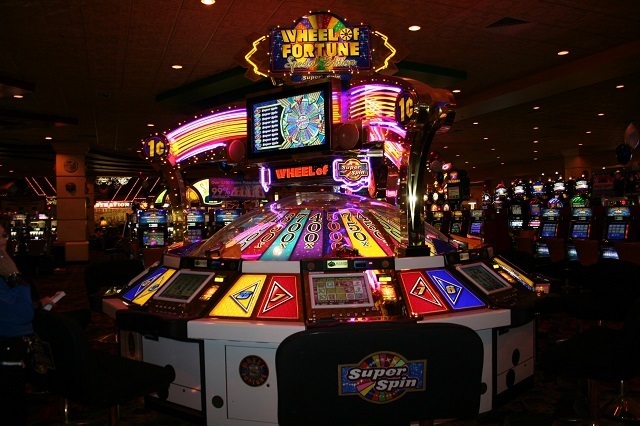 Electronic gaming machines come in all shapes, sizes and types of game. Image via Public Domain Pictures. Most machines in Australia are now digital and the games come in a huge variety of artwork and formats. Some are tied in to other forms of casino games such as poker whilst others are branded with tie-ins to sports, movies and popular culture. The pay-out rates of machines vary state by state with Queensland operating a minimum of 85% whilst casinos must return 90%. The range of pay-out rates is in the region of 85% to 95% depending on where you play. Cash wins also vary by venue; some EGMs have progressive jackpots with a club in Coffs Harbour netting one punter a take home of $350,000! The biggest win in the world was taken home online by a UK ex-veteran when he won a progressive jackpot worth £13.2 million (AU $23 million). Certainly, online pokies can offer bigger jackpots due to the sheer volume of players (see Best Online Pokies Sites for Aussies, below). Wins on pokies can be modest or life-changing depending on where you play and how lucky you are. Image via Caloundra RSL. 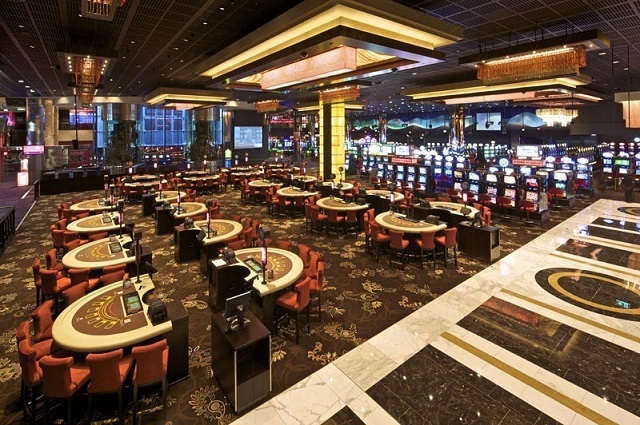 Each state issues licenses for pokies for venues in its jurisdiction, these can be held by pubs, clubs, hotels and bars as well as (in some states) casinos. The number of licenses held by any establishment doesn’t always mean they run a full quota of machines but we have pulled together our lists of those venues in each major Australian city with a good selection of licenses. There are more than 4500 pokies in the ACT making this Australian state one of the highest per capita home of the slots with one machine per 88 residents. Most of the slots in the ACT are situated in the state capital of Canberra but, unusually, there is no license for any pokies in the city’s casino. The decision by the authorities to protect the gaming interests of smaller clubs and bars is one that is welcomed by the communities who benefit from them. This includes social clubs where money generated from the slots are re-injected into their own projects. Unlike many states, none of the ACT’s pokies are in the city’s casino. Image via Pixabay. The best places to play the pokies in the city are no doubt the Belconnen Labour Club which currently has a license for 282 machines and also has a schedule of good bingo nights plus a sports bar with TAB services. The Tradies has slightly more pokies with 309 machines. There are around 100,000 pokies in New South Wales making it the state with the highest number of slots in all of Oz (or one for every 77 residents). In fact, the only place in the world with more EGMs is in Las Vegas. Star City, Sydney is home to 1.5% of NSW’s pokie population. Image via Pinterest. The states casinos have a good deal of these licenses but there are also several thousand pokies situated in smaller pubs, clubs and hotels. However, regulations in the state mean that hotels can only have a maximum of 30 machines with those having more than ten required to have a separate gaming room. Clubs are not restricted by total number but those who wish to have more than 450 must demonstrate that the presence of these pokies will not have a negative impact. The Star Casino has a license to operate up to 1500 EGMs and the gaming floor has plenty of variety to keep pokie fans happy. Situated in the heart of Pyrmont, the casino is a popular place to game. The top 25 pubs in New South Wales with the highest profits from the pokies are all based in Sydney. Together they make a total profit of $253 million. The top five of these being the El Cortzez, Railway, Markets, Eastwood and Cross Roads Hotels. A total number of licenses for pokies of around 2,000 is permitted in the Northern Territory with caps on hotels and bars of just 20 machines and a maximum of 55 allowed in clubs. Only venues that hold a liquor license can hold an EGM license. The two casinos, Sky City Darwin and Alice Spring’s Lasseter’s Casino, hold the majority of licensed pokies with almost 1000 between them. With a population of just 244,000, this means NT has the highest density of pokies in the country at a rate of one machine per 131 residents. 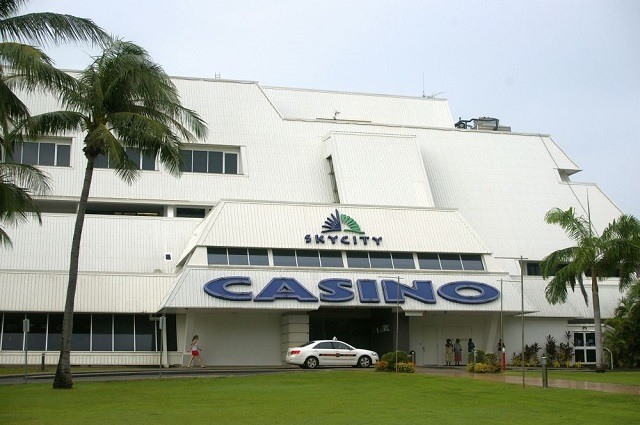 One of two casinos in the Northern Territory, Darwin’s Sky City is a popular place to play the pokies. Image via Wikimedia. There are more than 46,000 licensed pokies in Queensland. With a population of just under 5,000,000 that equates to one pokie per 110 residents. Spread across 1,188 venues, you can find EGMs in a wide variety of venues including hotels, bars, clubs and the casinos. The Treasury Casino has the majority of Brisbane’s pokie machines with a total of 1300 licenses. Situated in the heart of the city, there are plans to replace the current site with a purpose-built multi-purpose leisure complex. Due to be constructed by 2022, it is likely that the new casino will have larger gaming facilities with many more pokie machines. Some of the pokies at the Treasury Casino, Brisbane. Image via Treasury Casino. Some of the new pokie games at Star Casino, Gold Coast. Image via Star Entertainment. Long known as the playground of Queensland, the Gold Coast is home to almost 6,000 pokies in addition to the 1,600 located at the Star Gold Coast Casino. Another popular location for pokies is across the Sunshine Coast where you can find more than 3,500 EGM’s. Licensed venues range from clubs to taverns, hotels and bars. South Australia has a total of around 13,000 licenses for electronic gaming machines with 1000 of these being licensed to the casino in Adelaide, Sky City. With a population of 1.7 million people, the density of one pokie per 131 residents in the state is low at 0.007. Adelaide has a good mix of venues to play the pokies, other than the Sky City Casino. Most are hotels or bars with a couple of clubs thrown in to the mix. The island state of Tasmania has a total of 3,550 pokies with 1,185 of these being licensed to the two casinos; Wrest Point in Hobart and the Country Club Casino, Meander Valley. At a rate of one pokie per 59 citizens, the island does alright with the per capita number of licenses. This pokie player at Wrest Point, Hobart has either won pretty big or someone needs to check this EGMs wiring! Image via Wrest Point Casino. However, a bold and controversial move by the current Labor government has proposed that the state is to follow the example set by Western Australia and become pokie-free by 2023 (with the exception of a monopoly license held by the casinos). With a population that exceeds 6 million people and only 29,000 pokies, the density of EGMs in the state is just 1 pokie per 207 residents. Most are situated in and around the state capital with almost 10% of the total licenses being assigned to the state casino. All licenses issued are currently valid until 16 August 2022 when the Victorian Commission for Gambling and Liquor Regulation is due to review its pokies policies. At present, licenses are issued to different regions with caps in place for both Melbourne and Geelong. The Crown Casino, Melbourne located at 8 Whiteman St, Southbank VIC 3006 holds 2500 pokies licenses and is by far one of the more popular venues to play on the slots in the city. Holding almost 10% of Victoria’s pokie license, the Crown, Melbourne is one of the largest pokie venues in the state. Image via Flickr. In a reverse situation to that of the ACT, there are no licensed venues operating pokies outside of the state’s only casino. You can find the Crown Casino at Great Eastern Highway, Burswood, WA 6100. The casino has a monopoly on all pokie play in Western Australia. Image via Crown, Perth. Of course, if you don’t fancy leaving the house then you can always play the pokies online and, whilst the physical feel of dropping coins in the slot might not be for the purists, the odds are still good and the potential wins just as big. The Interactive Gambling Act makes it illegal for online casinos not licensed in Australia to offer gambling service over the internet. However it isn’t an offence for players to access sites that are prepared to accept players from Oz. A lot of the casinos host microgaming pokies which are operated across a network. This means that progressive prize pools can grow more quickly and allow the sites to offer huge jackpots. One such game is Mega Moolah, one of the biggest cash pokies prizes online. Launched in 2012, Emu Casino has a range of 800+ games including almost 500 pokies titles. The site has recently been relaunched (2017) and now features a more responsive game play which is compatible with mobile devices. Welcome bonuses are pretty normal and won’t set the world on fire but the payouts will keep you coming back. Jackpots range from some standard cash prizes to some pretty big progressive jackpots. If that wasn’t enough to make you bookmark Emu Casino, they offer a loyalty program which lets you earn points every time you play; build up the points to bonuses like free spins, higher percentage wins and cash drops. VIP members can also earn reductions in transaction fees, exclusive bonuses and offers as well as invitations to hospitality events. Games range from traditional 3-reel slots and retro style play to bang-up-to-date 3D titles.Favorites like Tomb Raider, Hitman and Dark Knight prove just as popular online as they do in land based venues. AUD is accepted and setting up an account is very straightforward so you can start playing quickly. Overall, a good site with excellent support to service a great site. There are no prizes for guessing that this is an Aussie friendly site and one that accepts deposits and withdrawals in AUD. Licensed in the UK, the site was established in 2013 and also hosts players from a lot of international countries. It’s a casino site with the usual table and card games as well as some sports betting. The slots are just one side of the offering and the sites staple diet when it comes to gameplay. There are three main varieties which include some good progressive jackpot games (Tiki Wonders, Mega Fortune etc). Most self-respecting Aussies will bridle a little over the stereotyping of the sites appeal and see through the crocs and roos but that’s the Brits for you. G’Day is a site that may be trying to do too many things and there are definitely some elements (sports betting, layout and graphics) which could do with improvement. However, payout rates are good and the mobile version of the site works well with the pokies (seems to be all it works with). One of the oldest online casinos in the world, Gaming Club was founded in 1994. Far from being too long in the tooth for the game, the site has advanced technology in operation and the site is slick, secure and easy to use. Despite being a popular casino the Gaming Club offers some good sign up incentives particularly for the slots. Some games are hosted with Flash for instant play but the majority of the site works best if you download the Gaming Club software to your PC. The site is also optimised for mobile play. Reel games are varied and offer some great jackpots and most have stunning graphics and sound to really crank up the virtual reality. As well as the pokies, you can also play almost every casino game going and there are even scratchies you can play. Gaming Club has a high payout rate and accepts players from Australia along with AUD. Launched in 2012 and licensed in Curacao, Guts accepts AUD and won the Best New Casino 2013. The site has a good style and has become one of the go-to sites for many Australian players for a number of casino games including scratchies. They run regular promotions for deposit bonuses and the initial sign up incentives are also pretty good. Their range of pokies isn’t the largest but the site does cater for most tastes when it comes to game play styles and jackpots. A good payout rate is also a benefit. This gaming site has some big welcomes bonuses to encourage online sign-up and a good loyalty program. House of Jack is licensed in Curaco but makes deposit and withdrawal available in AUD (nice and easy for residents but expect to have to prove you ID). There is a big range of slots available, some with sizable progressive jackpots which can pay out big. And pay-out rates are pretty good with most reports suggesting percentages of 96-98% which is higher than land-based slots. As well as pokies, there is also a good range of casino games to keep the site ‘sticky;. There isn’t an app but the site is mobile friendly, responsive and well-designed for playing on the go. Launched first in the USA in 2016, Ignition is new to the Australian market. The site has some good sign-up offers but limited deposit and withdrawal options when compared to others. The range of pokies is quite diverse and takes advantage of several developers meaning that gameplay is broader than some more traditional offerings. There are a few hundred titles to play with more in the offing. Prize and stakes vary and some jackpots are progressive with wins in excess of $1 million reported on the site. As well as slots, Ignition provides a good range of table games, video poker and other popular Australian games like Keno and Bingo. The mobile site is quite good but needs some work to make it 100% compatible as some games either don’t work or are not quite as responsive. With payouts reaching almost 98%, Jackpot City has a solid reputation for pokie play online. Launched in 1998 and licensed in Malta, the site is both trusted and secure and many Australians call it the home of the jackpot. One of several sites that hosts the Mega Moolah progressive jackpot game, Jackpot City has many huge wins under its belt. Players can opt for traditional or classic slots or try some new titles across the big range of games. Launched in 2016, Mucho Vegas was an instant success in Australia offering a big slots collection including 3-reel, 5-reel and video games. Their stock offering of pokies are developed by some of the biggest names in 3D gaming and the quality shows. There are plenty of sign-up perks and ongoing promotions to keep punters happy as well and is certainly one of the sites biggest draws. The site is well-designed, very responsive and works well on mobile. Deposits and withdrawals can be made in AUD and there are some good payout rates as well as big prizes. The only drawback to the site is its high wagering conditions on those bonuses. Get that fixed and Mucho Vegas could become one of the top go-to pokies sites in Oz. Licensed in Malta and providing a full range of casino games since 2004, Platinum Play markets itself to casino players who like interacting with real dealers. Their pokies offering is definitely the main show here with table and card games now more of a side-show along with scratchies, Keno and video poker. Payouts range from 94%-96% and games can be played via mobile or on instant play technology. The site is another that belongs to a network of microgaming which means that progressive jackpots can get pretty big. Though they have a good range of pokies and prizes are good and regular, the overall design of Platinum Play is, for some, a little tired. For others this just means the games themselves take center-stage. Operating since 2003, Ruby Fortune has been operating a tight ship since it won the Best New Online Casino award more than a decade ago. Licensed in Malta and providing a good range of deposit and withdrawal options, the site offers more than 300 pokie games to play. Payout rates are around 95-97% with some big jackpots available across all of their casino games including the slots. The design of the site is good and features instant game play which is compatible with most mobile devices. Overall, the site is slick, simple and quick to get going with some nice classic, plus some unfamiliar, titles. Offering one of the biggest selections of over 1800 slot games, this site is one to bookmark for regular players. Hosting games developed by almost 25 different games providers, the titles available on Slots Millions offer one of the best selections of pokies available online. All games are launched with Flash technology so you don’t need to download any special software for play on a PC. However, you can download their app to access games on your portable device (iOS and Android). The app doesn’t have the same range of games available as the website but still more than most with 500+ titles (Game of Thrones, South Park: Reel Chaos and The Invisible Man). Some of the jackpots are progressive and there is a Mega Moolah game which regularly pays out prizes in excess of $5 million. Accounts are available in AUD and there are usually some great sign up bonuses for new users. Slots Millions is a pokies online site so don’t expect any table or card games here. With a reported AU $5 million being paid out daily and deposits taken in AUD, the Spin Palace site ticks two boxes; big cash prizes and Aussie friendly. The payout ratios across its 650+ games is high and is generally around 97-98% range. Not only that but you can access your winnings within 48 hours via instant withdrawal via your preferred payment method. The tech of the site gives the games good graphics and responsive play with the mobile version working well. You can also access a range of other casino games including roulette, keno, blackjack and poker. The site has been running since 2001 and has established a solid reputation for itself in the online pokie world. Spin Palace is licensed in Malta and offers 24/7 support for all players. So, there you have it; a complete guide to the pokies in Australia. Just remember that however and wherever you play the slots in Oz, always gamble responsibly.